Multiple first aid uses, unique angled-blade design. The ideal pair of scissors for any first aid kit. Small and durable. 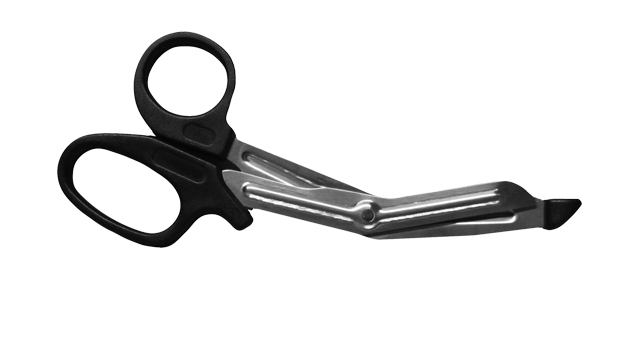 The unique shape and design of these compact scissors makes them ideal for cutting bandages quickly and efficiently in a first aid emergency. These all-purpose utility shears are made to last! Features large handles for easy maneuvering, surgical-sharp blades with deep serrations, and an extra-large rivet for increased strength and power. These all-purpose trauma shears are made to last! Features large handles for easy maneuvering, surgical-sharp blades with deep serrations, and an extra-large rivet for increased strength and power.